Fermented foods are nothing new. In fact, fermentation is one of the oldest methods of food preservation there is. Aside from fermented fruit juices (importantly, wine) common fermented foods include yoghurt, cheese and pickles. But what exactly is fermentation and how can adding fermented foods to our diet benefit our health? Fermentation is a naturally-occurring process in which bacteria or yeast break down sugars in an airtight environment, to form acids or alcohols. The method most commonly used for fermenting foods is called lacto-fermentation, not because it involves milk or dairy products, but because it relies on lactic acid-forming bacteria naturally found in our soils. The aim is to create ideal conditions for probiotics or good bacteria to grow, along with a variety of beneficial enzymes and essential vitamins. A look at the fermentation process. 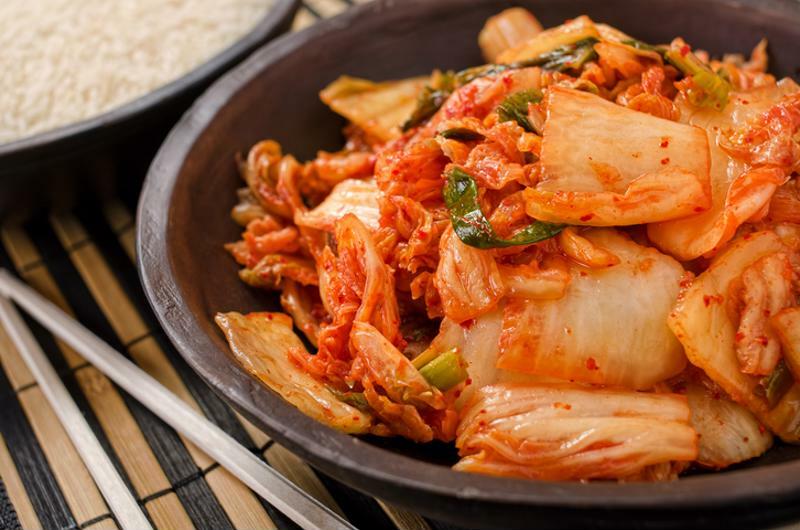 Fermented Foods: Why Eat Them? 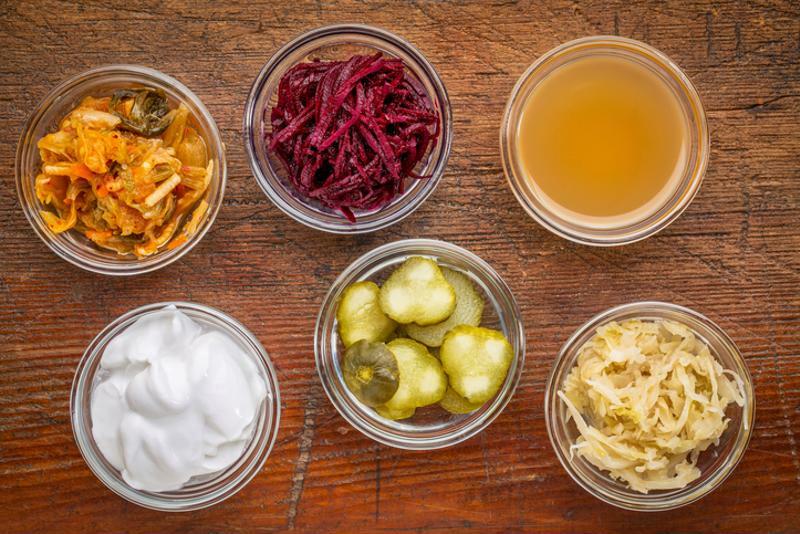 Fermented foods contain a variety of beneficial probiotics, vitamins and enzymes to help promote a healthy gut. Maintaining the right balance of 'friendly' gut bacteria comes with a whole host of health benefits from improving digestion to helping our bodies fight disease. There are benefits to eating fermented food. Improve your digestive health. Probiotics, also known as 'friendly bacteria', actively support the beneficial bacteria in your gut. Overuse of antibiotics and diets rich in sugars and processed foods can disrupt this bacterial balance, leading to digestive complaints such as constipation, flatulence, Irritable Bowel Syndrome and even allergies or food intolerances. Increasing your consumption of probiotics can help to improve digestion, bowel function and even eliminate bad breath! Boost your immune system. We now know that over 80% of our immune cells are found in the gut. In addition to defending the gut by supplementing our friendly bacteria, probiotics can synthesize a wealth of immune-boosting B and K vitamins which help prevent cell damage along with powerful enzymes that destroy harmful bacteria. Absorb more nutrients. The fermentation process kick-starts the breakdown of foods by producing digestive enzymes. This makes fermented foods easier to digest and their nutrients more readily available. Milk kefir, for example, is usually well tolerated even in people with lactose intolerance. In fact, regular consumption may even help to alleviate allergy symptoms when they do consume whole dairy products. Save on dietary supplements. If you're already sold on the amazing benefits of probiotics, you might have chosen to add these to your diet in supplement form. But probiotic supplements can be expensive and the bacteria they contain are easily damaged during transport and storage. Fermented foods are a fresh, convenient and budget-friendly source of probiotics that will add a variety of new flavours to your diet, too. And if you grow your own vegetables, fermentation is the perfect way to preserve your summer crop to enjoy throughout the winter months! Embrace the health benefits of fermented food. 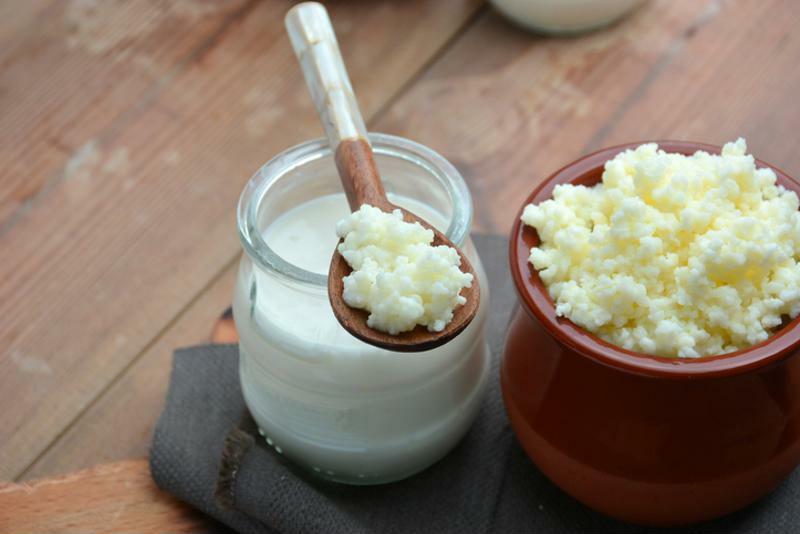 Traditional kefir is a fermented dairy product, similar to yoghurt, but with significantly more gut-friendly bacteria. It is most commonly made using cow or goat milk, but versions can also be made with nut milks and even sugar water. Gelatinous kefir 'grains' are added to your choice of milk and left to ferment over 24 hours. The result is a tangy substance with a consistency similar to drinking yoghurt, packed with friendly bacteria! Kefir is a fermented food similar to yogurt. Kimchi is a dietary staple in Korea. Kombucha is a fermented tea made with water, sugar and bacterial cultures. It's naturally fizzy, making it a popular alternative to carbonated drinks. Getting started with fermentation at home is easy with some simple planning. 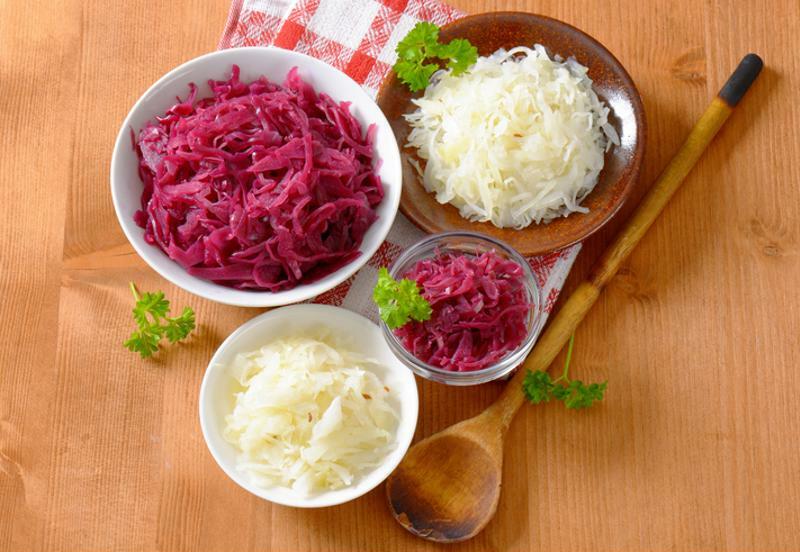 We recommend starting with a simple vegetable ferment such as sauerkraut if it's your first time. It's essential to use a clean, airtight container to avoid cross-contamination and prevent oxygen inhibiting the fermentation process. Sauerkraut is a traditional fermented cabbage dish, popular in Germany. It makes a delicious relish that's particularly tasty on burgers or sausages and like most fermented products has a distinctly tangy flavour. 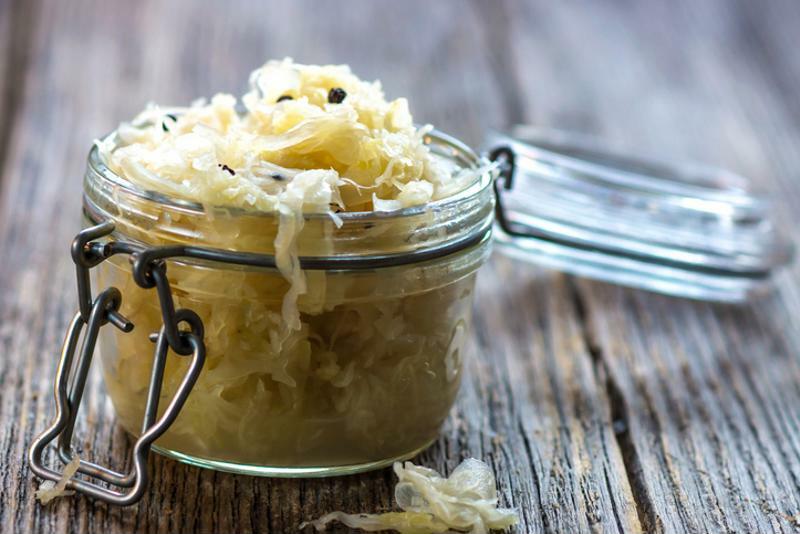 It's a great home ferment to get you started, so we've included a simple sauerkraut recipe below! Sauerkraut tastes great on burgers and sausage. Prepare your cabbage by removing the outer leaves and core, then finely slice. Place the cabbage in a large mixing bowl and sprinkle with salt. Work the salt into the cabbage until it becomes limp and watery (around 10 minutes). Add your caraway seeds now, if desired. Pack the cabbage mixture into a clean, airtight container. Top up with filtered water if required, to ensure the cabbage is completely submerged. Leave at least 1 inch at the top of the container. Seal and store at room temperature. Leave to ferment for 5-10 days, to taste. Seal and store in the fridge for up to 1 year. Fermentation is not an exact science, so be prepared for some trial and error. 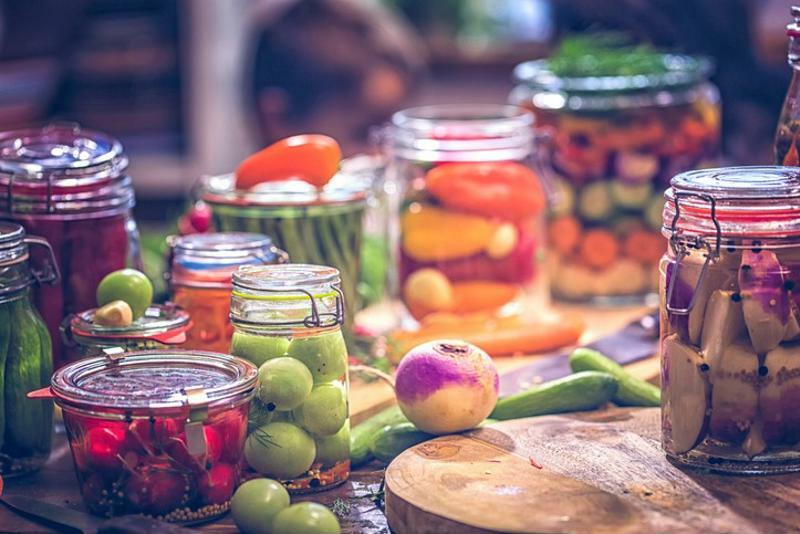 Make sure your hands, utensils and storage containers have been thoroughly cleaned before you begin to prevent pesky contamination that could ruin your ferment. Ready to try your hand at fermentation? Use our vacuum sealed FoodSaver systems to lock out unwanted air and moisture during your ferment and keep foods fresh for up to 5x longer! For more about our innovative vacuum sealers, visit our homepage.